For the analysis of complex reactions such as the release of gases from additives made of polymer blends, thermogravimetric analysis alone is often not sufficient. 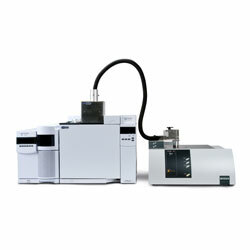 Coupling the thermobalance (TGA) to a gas chromatograph (GC), however, yields additional findings to help in identifying the components released. NETZSCH, in collaboration with JAS (Joint analytical Systems), has forged a breakthrough improvement in reaction gas analysis. Reaction gases from the TGA are fed directly into the GC valve box by means of a heated transfer line. 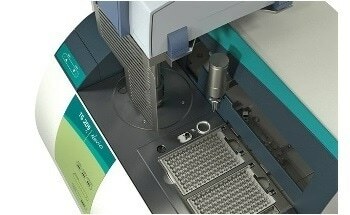 Via a sample loop, the substances then arrive at the GC column, where they are separated and then analyzed by means of a mass selective detector. What sets the new system apart is the fact that the start of the measurement is event-driven. This enables temperature-correlated detection of the substances released, which in turn allows for direct correlation with mass loss steps. By comparison, in other systems where TGA is coupled to GC, the reaction gases are usually bound in their entirety to an adsorber and only defined once the thermogravimetric analysis is complete. The disadvantage of such a system is that it does not allow for any conclusions to be drawn with reference to the time of the release of the compound.